Penang, the Pearl of the Orient, is a fascinating fusion of the East and West. The state embraces modernity while retaining its tradition old world charm, which are reflected in its harmonious multiracial populace and well-preserved heritage buildings. Long regarded as the food capital of Malaysia, it also entices visitors with its beautiful coasts and scrumptious cuisines. Comprising the island of Penang and Seberang Perai, its seat of government is located in the bustling city of Georgetown. Travellers can select their accommodation from among various well-appointed hotels, five-star resorts and budget inns located throughout the state. 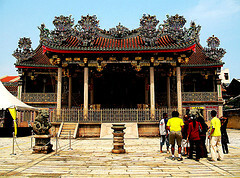 Khoo Kongsi Khoo Kongsi is one of the grandest clan temples in the country. 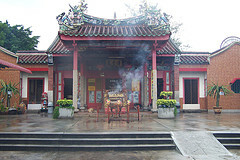 Clustered in its square are an elaborately embellished temple, association building, a traditional theatre as well as several 19th century row houses. Kek Lok Si Temple Reputed to be the biggest Buddhist temple complex in Southeast Asia, the temple stands majestically on a hill in Air Itam. 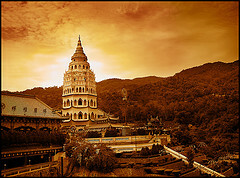 It boasts the beautiful “Pagoda of Ten Thousand Buddhas” which blends Chinese, Myanmarese and Thai architecture. 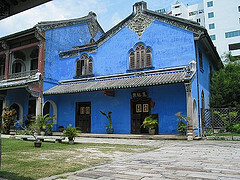 Cheong Fatt Tze Mansion Featuring 18th and 19th century Chinese architecture, this stately mansion comprises beautiful bedrooms, libraries, ceremonial halls, courtyards and gardens. It also houses a rare porcelain collection, sculptures, carvings, tapestries, embroideries and antiques. Fort Cornwallis The fort was built on the site of Sir Francis Light's historic landing in 1786. Originally a wooden stockade, it is now a concrete structure and currently houses cannons, a history gallery, cafe, handicraft and souvenir centre as well as an open-air amphitheatre. War Museum Built around the remnants of a British fort, this 20-acre museum contains several installations above and below ground where old war relics are stored. Visitors can weave through a complex to view barracks, old cookhouses, lock-ups, tunnels and ventilation shafts. Penang Museum Hundreds of old prints, paintings, clay, stone and porcelain ware as well as other historical artefacts that highlight the important periods in Penang's development can be found here. Kapitan Keling Mosque Built in early 19th century, the mosque features an ochre yellow facade and a dome-shaped minaret reflecting Moorish Islamic influence. It was named after the Indian Muslim merchant, the Kapitan Keling (headman), Caudeer Mohudeen. Acheen Street Malay Mosque Built in 1820 on land donated by Syed Sheriff Tengku Syed Hussain Aidid, the vernacular-style mosque, also known as Masjid Melayu, features an octagonal minaret and a Moorish arcade. Chinatown Large and well-preserved, its numerous clan houses, shophouses and temples provide a fascinating insight into the lifestyle of early Chinese immigrant settlers who came here in the 1800s. Little India This quaint Indian town dates back over two centuries and boasts the 167 years old Sri Mahamariamman Temple. Worth browsing here are the pre-war terrace buildings which house restaurants, jewellery and textile shops, dress retailers, music stores, barbers as well as shops selling spices, sundries and cutlery. Pinang Peranakan Mansion Contained in this mansion are elaborate traditional costumes and accessories, lovely porcelain pieces, furniture, works of art brought in from China and Europe as well as artefacts related to the history and colourful lifestyle of the Baba Nyonya people of Penang. St. George's Church The church is one of the oldest landmarks in the city and was named after the patron saint of England. It features a memorial canopy dedicated to Captain Francis Light. Wat Chaiya Mangkalaram A unique Buddhist temple with Thai, Myanmarese and Chinese architecture, it houses a 33-metre gold-plated reclining Buddha said to be one of the longest in the world. The niches behind the statue house urns contain the ashes of devotees. P.Ramlee's House Originally built in 1926 to commemorate the late P.Ramlee, Malaysia's foremost entertainer, the house features the life history of the late singer, actor, composer and film director. The various exhibits include his personal memorabilia and also items belonging to his family. Penang Hill Malaysia's first hill station, Penang Hill is 830m above sea level. Ascend to the top by hiking up or by travelling in the funicular train which has been operational since 1922 and enjoy the cool climate as well as the fantastic view at the summit. Penang National Park The park offers excellent hiking trails which lead to secluded beaches at Teluk Duyung, Muka Head and Pantai Kerachut. It also has a turtle nesting site as well as a unique meromictic lake. Tropical Spice Garden Visitors can get a feel of plants, birds and insects in a tropical environment at this eight-acre garden which has over 500 exotic varieties of plants. 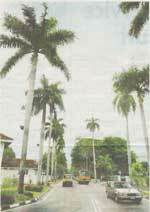 Tropical Fruit Farm Spread over 25 acres of hilly terrain, the farm produces over 200 tropical and subtropical fruits including durians, lychees, mangoes, guavas and several lesser known varieties. Penang Butterfly Farm The farm spans 0.8ha and is home to 3,000 living specimens from over 50 species of colourful butterflies, frogs, scorpions and other insects. Penang Bird Park The park spans 5 acres and houses some 800 birds from all over the world. It is beautifully landscaped and features a walk-in aviary, ponds and ornamental plants. Gurney Drive A favourite haunt for food enthusiasts, this coastal road is famous for hawker foodstalls and restaurants offering a mouth-watering selection of Penang specialities such as asam laksa, hokkien mee, chee cheong fun, pasembor, rojak and various other delicious local delicacies. Shopping, Dining and Entertainment Penang is a shopper's paradise for goods old and new at bargain prices. There is a wide choice of electronic and electrical goods, cameras, clothing, batik, souvenirs and antiques. The island also boasts some of the best food in the country. An exciting choice of entertainment including concerts, dramas, cultural performances as well as sports and recreational activities are available throughout the state. Penang is easily accessible by air as it is served by airlines plying international and domestic routes. Travellers can also choose to travel by road via the North-South Expressway. Upon reaching the mainland, a short drive across Penang Bridge or a 20-minute ferry ride is all it takes to get to Penang island. Getting to Penang via rail is possible to as there are regular rail services to Butterworth from major towns in Peninsular Malaysia. PULAU Tikus, or Rat Island , in Penang is neither an island nor is the whole area infested with rats or mice. The Penang Bridge was built by the Government at a total cost of RM800.00 million (excluding the cost of land acquisition). 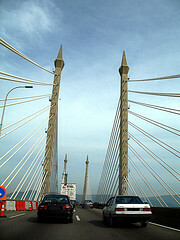 With 3 interchanges, the 13.5 km Penang Bridge of which 8.4 km is above water was officially open to public on 14 September 1985. It has 533 spans of which 192 spans for the Bridge is above water.